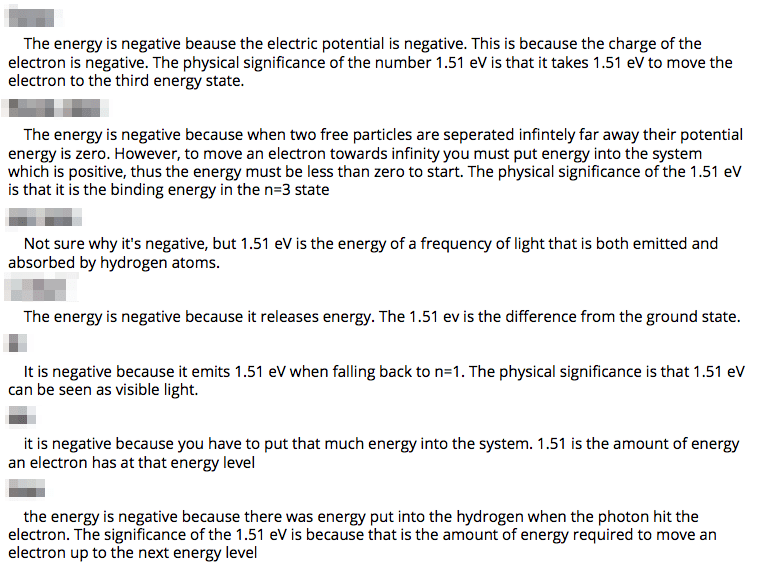 The responses clearly demonstrated that there was a substantial number of students who attributed the 1.51 eV as the difference in energy between the ground state and n=3 instead of the difference in energy of the electron between n=3 and infinity. If I had asked someone to volunteer and answer the question, I never would have realized how few students understood! 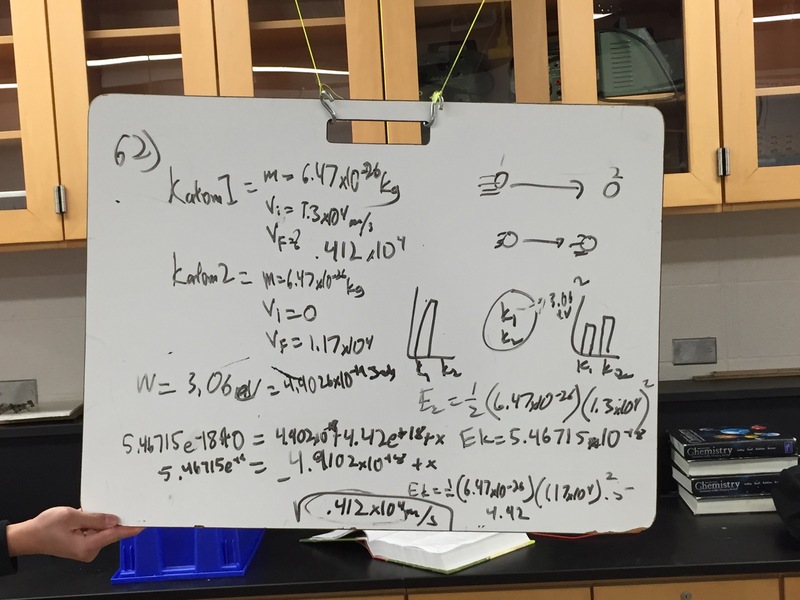 Today, AP Physics 2 students whiteboarded a series of problems concerning spectra. While a conceptual understanding of energy levels and spectra are necessary, most of the problems concerned conservation of energy. I was pleased that some groups even drew energy LOL diagrams on their whiteboards! Today, there were only two or three juniors in each of my AP Physics 2 classes. We worked on practice problems together. Seniors had various senior activities, including an assembly where a small portion of the class get hypnotized. It is amazing and hilarious! Why do different elements have different spectra? Why is the absorption spectra a subset of the emission spectra for an element? Why don’t electrons give off energy and spiral into the nucleus? I also shared how spectra is a critical tool in astronomy so students appreciate this phenomenon. Today, students started to explore the Bohr model of the hydrogen atom by analyzing the hydrogen spectra. They used a couple of pins and polar graph paper to sight the angle of each spectral line. They then calculated the wavelength and energy of each line. I provided them with the energy levels of the hydrogen atoms without stating the source to see if they could identify the pattern. While most groups accurately measured the spectra, they didn’t immediately connect the energy of the line to the transition between energy levels. We’ll discuss this more tomorrow. Do these experiments support the wave model of light or the particle (quantum) model of light? Support your claim with multiple examples based on evidence from the experiments that both support your selected model and refute the other model. You should reference every experiment performed yesterday in your response. Yesterday, students measured the relationship between stopping potential and light intensity and light frequency. They also measured the relationship between time to charge the capacitor and light intensity. This prompt was pretty much the same as what I used to include as discussion questions for this lab. However, this year, to help students prepare for the AP Physics 2 exam, I’m taking some of the lab discussion question and making them into paragraph-length response questions that students complete in class with limited time. 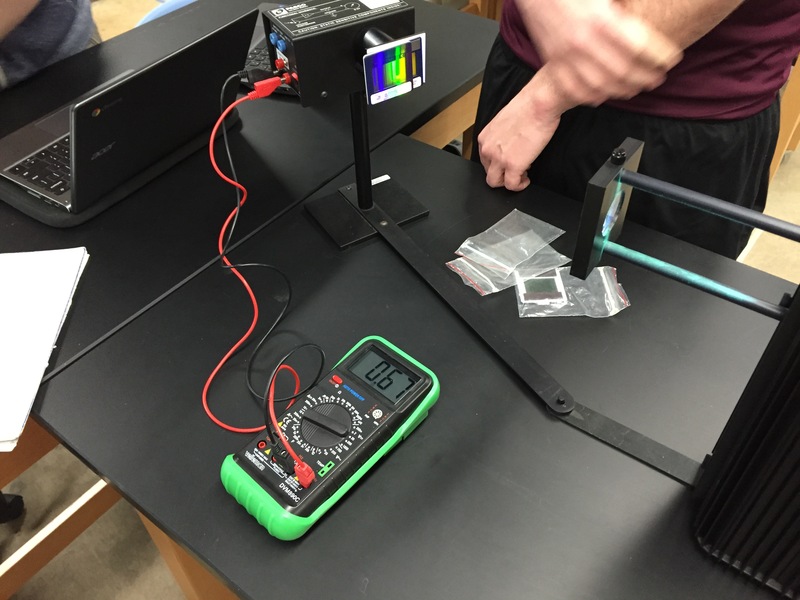 Today, AP Physics 2 students returned from break and completed the first half of the photoelectric effect summative lab. Throughout this lab, they use PASCO’s excellent (and discontinued) h/e apparatus. This first half of the lab has students measure the time to recharge the capacitor for different intensities of light and measure the stopping potential for different frequencies of light. Tonight, they will graph stopping potential versus frequency, interpret the significance of the slope and y-intercept, and solve for h and the work function based on their graph.